Orathai Ard-am is professor in the Institute of Population and Social Research at Mahidol University, Bangkok. She is now working as a research fellow at the Research Center on Development and International Relations, Department of Development and Planning, Aalborg University, Denmark, and is writing a Ph.D. dissertation tentatively titled "Democracy, Civil Society, and Socioeconomic Development in Thailand." Her publications include "The Province of Nan: On Its Path towards Civil Society in Thailand" (1998), "Strengths and Weaknesses of Donwan Sub-district in Upgrading to the Community of Good Governance" (1999), "AIDS Care Volunteer Network Building" (1997), and "What Factors Are Important to Make Strong Community: Experiences and Lessons Learned from Nan and Mahasarakam" (1999). Mike Douglass is a professor in the Department of Urban and Regional Planning at the University of Hawaii. A specialist in planning in Asia, his current research includes globalization and urbanization on the Pacific Rim, urban poverty and the environment, foreign workers in Japan, rural-urban linkages in national development, and managing mega-urban regions in Pacific Asia. He has been a Shorenstein Distinguished Lecturer at the Institute for International Studies at Stanford University, Perloff Chair in Urban Planning at UCLA, a visiting fellow at the University of Hong Kong, a senior research fellow at the Program on Environment East-West Center, and a visiting scholar in the Faculty of Economics at Tokyo University. His most recent books are Cities for Citizens: Planning and the Rise of Civil Society in a Global Age (1998, coedited with John Friedmann) and Culture and the City in East Asia (1997, coedited with Won Bae Kim). Peter Evans is professor of sociology at the University of California, Berkeley. He is also director of the Working Group on Social Capital and Economic Development of the Project on Social Capital and Public Affairs, a project of the American Academy of Arts and Sciences. His recent books include Embedded Autonomy: States and Industrial Transformation (1995) and an edited collection entitled State-Society Synergy: Government and Social Capital in Development (1997). His current research interests include environmental politics in the metropolitan region of Curitiba, Brazil, which is known as Brazil's "ecological capital," and in the northern suburbs of Rio de Janeiro, which are sometimes considered ecological disasters. Zsuzsa Gille was a participant in the peace and environmental movements in Hungary during the 1980s. She is assistant professor of sociology at the University of Illinois at Urbana-Champaign. Her main interests are environmental sociology, state socialism and postsocialism, globalization, economic sociology, and the sociology of knowledge. Her publications include "Cognitive Cartography in a European Wasteland: Multinationals and Greens Vie for Village Allegiance," in Global Ethnographies (2000); "Legacy of Waste or Wasted Legacy? The End of Industrial Ecology in Hungary," in Environmental Politics (2000); and "Conceptions of Waste and the Production of Wastelands: Hungary since 1984," in Environmental Issues and World-System Analysis (forthcoming). Hsin-Huang Michael Hsiao is a research fellow at the Institute of Sociology, Academia Sinica, and professor of sociology at National Taiwan University, in Taipei. He is one of Taiwan's leading sociologists and has written widely since the 1980s on the transformation of Taiwanese social structure, particularly the position of the middle classes. His work has also focused on environmental protest movements and the dynamics of civil society during the course of Taiwan's democratization. His recent publications include East Asian Middle Classes in Comparative Perspective (editor, 1999), Taiwan's Social Welfare Movements (editor, 2000), Changes in Southeast Asia (editor, 2000), and Chinese Business in Southeast Asia (coeditor, 2001). Margaret E. Keck is professor of political science at the Johns Hopkins University. 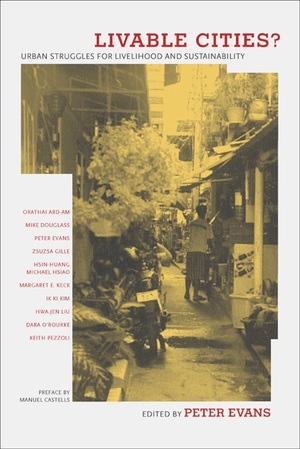 Her most recent book, Activists beyond Borders: Advocacy Networks in International Politics (1998, with Kathryn Sikkink), looks at the interaction of local and transnational environmental politics. Her many years of research on Brazilian politics is reflected in The Workers' Party and Democratization in Brazil (1992). She is currently working on a book on environmental politics in Brazil, tentatively titled "Politicizing the Environment: Activist Networks in Brazil," from which her chapter in this volume is drawn. Ik Ki Kim is professor of sociology at the Dongguk University, in Seoul. His recent publications include "Environmental Management of the Urban Poor: A Case Study of Wolgoksa-dong, Seoul, Korea," in International Journal of Urban Sciences; "The Effects of Population Growth on Environment and Sustainable Development in Korea" (1995); and "The Environmental Problems in Urban Communities and the Protection of the Environment in Korea" (1994) in the Korea Journal of Population and Development. Hwa-Jen Liu is a Ph.D. student in sociology at the University of California, Berkeley. She coauthored and published several pieces on Taiwan's anti-pollution protests and urban development in Asia's Environmental Movements (1999) and Chinese Sociology and Anthropology (1997). Her main interest is Third World social movements, and she is now writing a working paper on the environmental protests among Taiwanese peasants and fishermen during the repressive 1970s as a new form of anti-industrialism. Dara O'Rourke is an assistant professor in the Department of Urban Studies and Planning at the Massachusetts Institute of Technology. He has worked extensively with NGOs and international agencies to analyze the impacts of industrial pollution on communities and workers, to advance alternative production practices that prevent environmental and health hazards, and to develop systems for monitoring multinational supply chains. He conducted one of the first independent assessments of Nike's manufacturing practices in Asia, documenting the occupational and environmental health hazards faced by Nike workers. Recent publications include "Reinventing Environmental Regulation from the Grassroots Up," in Environmental Management; "Industrial Ecology: A Critical Review," in the International Journal of Environment and Pollution; and "Ratcheting Labor Standards," in the Boston Review. He received his Ph.D. from the University of California, Berkeley. Keith Pezzoli conducted field research on urban communities and environmental issues in Mexico City over a period of almost fifteen years. His book Human Settlements and Planning for Ecological Sustainability: The Case of Mexico City (1998) chronicles the results of this research. He received his Ph.D. in planning from UCLA. Currently, Pezzoli is the director of field research and a lecturer in the Urban Studies and Planning Program at the University of California, San Diego. He is the principal investigator of U.C. San Diego's Regional Workbench Program, a collaborative network of researchers and community-based partners dedicated to linking knowledge to action for sustainable urban and regional development (http://regionalworkbench.org). Pezzoli is currently working on a book project titled "Frontiers of Ecological Regionalism: Theory, Methods, and Practice." The sprawling cities of the developing world are vibrant hubs of economic growth, but they are also increasingly ecologically unsustainable and, for ordinary citizens, increasingly unlivable. Pollution is rising, affordable housing is decreasing, and green space is shrinking. Since three-quarters of those joining the world's population during the next century will live in Third World cities, making these urban areas more livable is one of the key challenges of the twenty-first century. This book explores the linked issues of livelihood and ecological sustainability in major cities of the developing and transitional world. Livable Cities? identifies important strategies for collective solutions by showing how political alliances among local communities, nongovernmental organizations, and public agencies can help ordinary citizens live better lives. Peter Evans is Professor of Sociology at the University of California, Berkeley. He is author of Embedded Autonomy: States and Industrial Transformation (1995), and coeditor of Double-Edged Diplomacy: International Bargaining and Domestic Politics (California, 1993), among other books. 7. Sustainability, Livelihood, and Community Mobilization in the Ajusco "Ecological Reserve"